If you are headed to New York City, don’t miss Discovering Columbus, the new temporary public art installation on display at Columbus Circle in New York City. 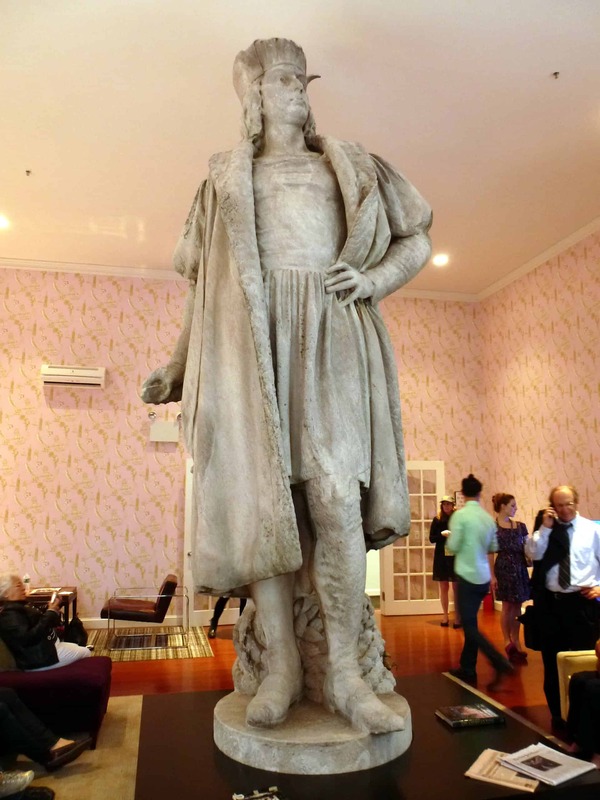 At the invitation of the Public Art Fund, Japanese artist Tatzu Nishi has wrapped an inviting living room around the iconic statue of Christopher Columbus. The exhibit is accessible either by climbing six flights of stairs through scaffolding, or by taking a small construction elevator that scales its side. When you step inside, you feel as if you have entered a gracious New York apartment with four large windows, a flat-screen TV, and comfortable sofas and chairs, with bookshelves housing a carefully curated collection of books written by and about Americans. The décor and feel of this living room in the sky looks quite homey. Even the repeats of the wallpaper include images of Michael Jackson, Marilyn Monroe, Elvis Presley and McDonalds, inspired by the artist’s perceptions of America. But the eye-catcher in the room is the close-up view you’ll get of the imposing 13-foot marble statue of Columbus, designed by Italian sculptor, Gaetano Russo, which appears to be sitting on top of the coffee table. Since 1892, the statue has stood on a 75-foot granite column above Columbus Circle, placed there in commemoration of the 400th anniversary of the discoverer’s voyage to America. Located at the intersection of Eighth Avenue, Broadway, Central Park South (West 59 Street), and Central Park West, the statue has commanding views of the city which you’ll be able to soak in, too, while you are there. On my way there, I overheard one jaded New Yorker on Eighth Avenue say to another: “Bloomberg has turned New York City into Disneyland.” I took it as a compliment. The exhibit is open from 10AM to 9PM daily until November 18, 2012. Free visiting passes, good for a 30-minute visit at a particular day and time, must be reserved, in advance, on the internet at the Public Arts Fund website. Well worth the climb!